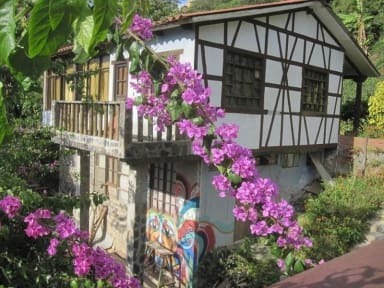 Beautifully located hostel with cozy roof terras overlooking the mountains. Owner Charlie is super friendly, always helpful and has a ton of information and tips for stuff to do around town. We had a double room with shared bath. The room was spacious, spotless, and the bed was the best we slept in during our 1 month in Bolivia. Breakfast is available for a small cost, and you can also get a delicious home cooked dinner. Highly recommended! Hostel Chawi was beautiful. A few minutes from the main plaza, there were beautiful views of green mountains, and we stayed in spacious and clean rooms. Charlie recommended us some lovely activities to fill our days with, the highlight being our visit to the animal refuge nearby in Yolosa. Over all a great weekend! The rooms were clean with comfortable beds. Location was perfect in a garden full of blooming plants and birdsong and beautiful views into the valley below with a nice terrace to have a beer on. Very friendly owner that made good vegetarian meals (corn pancakes and the best coffee we’ve had in a while) all made from local ingredients. Close to town, slept like a baby. Wish I could have stayed longer. 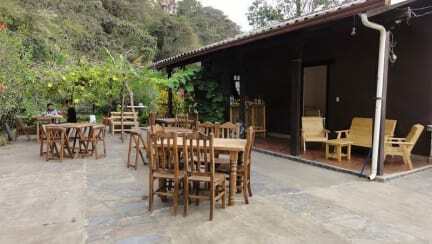 If your doing the death road, stay in Coroico for a couple days at this hostel to recuperate. My friend and I stayed at Hostal Chawi this past weekend and thought it was great. The dorm room and bathrooms were clean and the optional breakfast was delicious! Charlie, the manager was super helpful, kind and informative about the surrounding area. We really appreciated the hospitality! Really loved my stay at Hostal Chawi a few weeks back. I was a solo traveller and the owner gave me all the details I needed for my stay there especially regarding the hikes I was keen to do! Set in a great location just outside of town. Although breakfast isn't always available, if you get the chance take it! It's absolutely delicious. Very clean, the best showers in South America. Charlie was very informative about what to do in the area. We decided not to extend our trip here as the staff were quite like strict relatives, with lots of rules in place, and were inflexible at times. Unfortunate, as this place has lots of potential. I am extremely confused by this hostel!! The lady who owns it is extremely unfriendly, enforcing all sorts of arbitrary rules. Everyone staying ended up feeling so uncomfortable and unwelcome that everyone checked out the next day (some even checking out early despite having paid a non refundable deposit). There are so many hostel options in town for much much cheaper and nicer that I wouldn’t bother with this hostel. Also, breakfast is not included and only sporadically available.. Very basic hostel in a beautiful location. Lots of potential to be really good. Easy wLk into town and host very helpful with local information. Recommend Carlas garden for food and drinks. The most expensive hostel in the town I'm sure. Weird vibes, the staff were very strict with unusual rules. Definitely beautiful views but that was the only positive. I left before I was due to check out as it just was not worth the money and effort dealing with the staff. Breakfast is not included although was indicated otherwise prior to my booking. There are other hostels in the city for 30Bs a night, not 85 like here.